My May 7, 2018 post (Birds Flying Backwards) elicited scores of responses from readers who wanted to share their own experiences with relative motion. This post will be a reprise of the relative motion concept showing more examples of the effect. I’ve selected two of those submissions and created a graphic simulation for each. We’ll start with an example closely related to Birds Flying Backwards — air speed vs. ground speed. The negative ground speed occurred over the Gulf of St Lawrence. The flight was from Goose Bay Labrador to Pease Air Force Base near Portsmouth, NH. The aircraft was a Boeing KC-97, and we were flying at 18,500 ft. The cruise True Air Speed was 230 knots. At that latitude we flew Grid Headings but our True Course was about 270 (due west). It was winter and the jet stream headwind averaged 235 knots. The copilot was a Naval Academy Grad and he remarked on interphone “Either that ship in the channel is going very fast or we are going very slow.” It was night time and I had just plotted a 3 star fix that was on top of the position I plotted 45 minutes prior. After all on board got a good look at the speedy freighter below we turned away from the pole (left) and dropped down 2 thousand feet. That was the prescribed maneuver to break loose of a jet stream. The top graphic shows what was happening. I converted all the speeds to MKS and embellished it a bit by adding an ocean current. The prevailing current in that area would be driven by outflow from the Saint Lawrence Seaway, so I assigned a reasonable number to it just for instructional purposes. Also, cargo ships move faster these days, but Fessler says 15 knots (8 m/s) was about average back in 1960 when this happened. 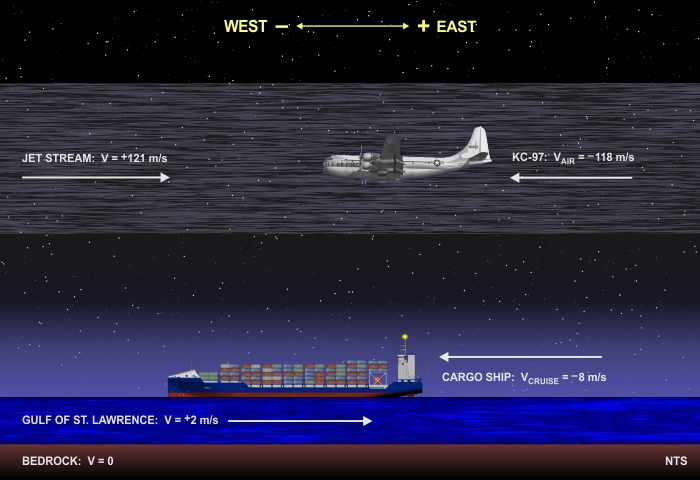 So both were traveling to the west, but the ship was moving 9 m/s (20 mph) faster than the KC-97! When combining motions affecting a given object, we simply use the vector sum (ΣV). But to find the relative velocity of A compared to B, we must subtract the velocity of B from that of A. When Fessler, an experienced navigator, saw his second position reading nearly identical to his first he knew immediately what was happening. But at night, in a region without many visible references (save for the stars), even experienced aviators can be momentarily confused. Reminds me of when I was going to school in Madison back in 1970. I wanted to go out on Lake Mendota but didn’t know anyone with a boat so I bought an inflatable raft and an oar. I went out on the lake by myself and when I started feeling sunburned, started to row back towards shore. For some reason, the more I rowed, the more distant the shoreline was becoming. I rowed faster but the shore kept getting more distant. Turns out the current pushing me out was more powerful than my ability to row toward shore. I kept losing ground like those birds flying backwards. Finally I saw a boat approaching me. It was the Coast Guard who kept watch over the lake and saw that I was in trouble. They threw me a tow line and pulled me back to shore. How humiliating, but I was so thankful they came to my rescue. Mendota can’t really have a “current” in the traditional sense, since it’s fed by the Yahara River through a narrow inlet and drains to Lake Monona through the Tenney Park Locks. So unless you were being pushed backward by a headwind, it sounds to me like you were caught in a wind-driven gyre. Or maybe both. 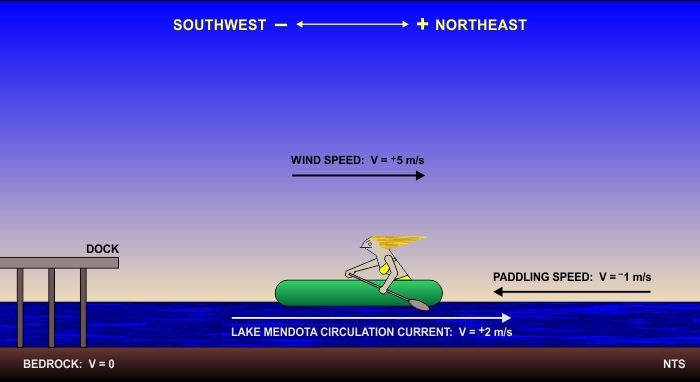 The gyre in Lake Mendota is intermittently created by prevailing southwesterly winds in that area. 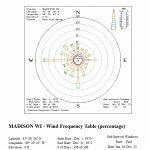 Take a look at the wind rose for Madison from 1970-1971 (first thumbnail). 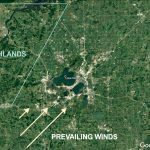 These winds can cause the lake to circulate in a counter-clockwise fashion. 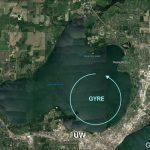 Given the location of the UW docks, and the direction back to them, that gyre is probably what impeded your forward progress. The other two thumbnails show geographic details of the Lake Mendota area. 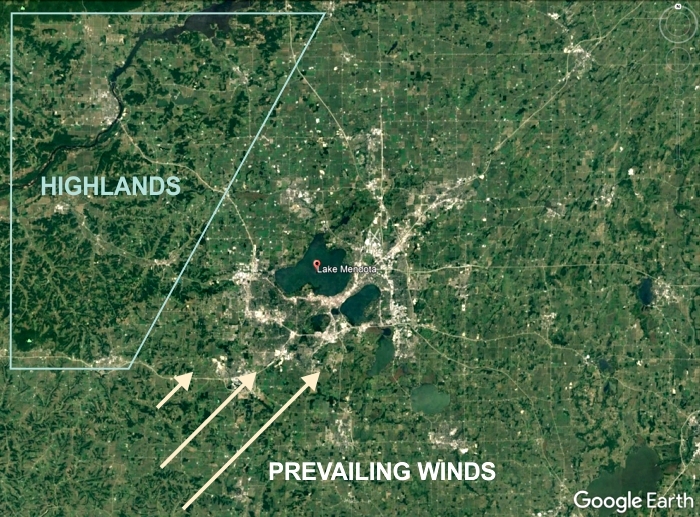 The key to forming a gyre is different wind speeds at different points on the lake, and the highlands to the northwest provide the topographic asymmetry that causes the speed differential. Once you get that much water circulating, the gyre can persist for hours even after the wind stops blowing. The Coast Guard often needs to assist nautical newbies caught like you were. 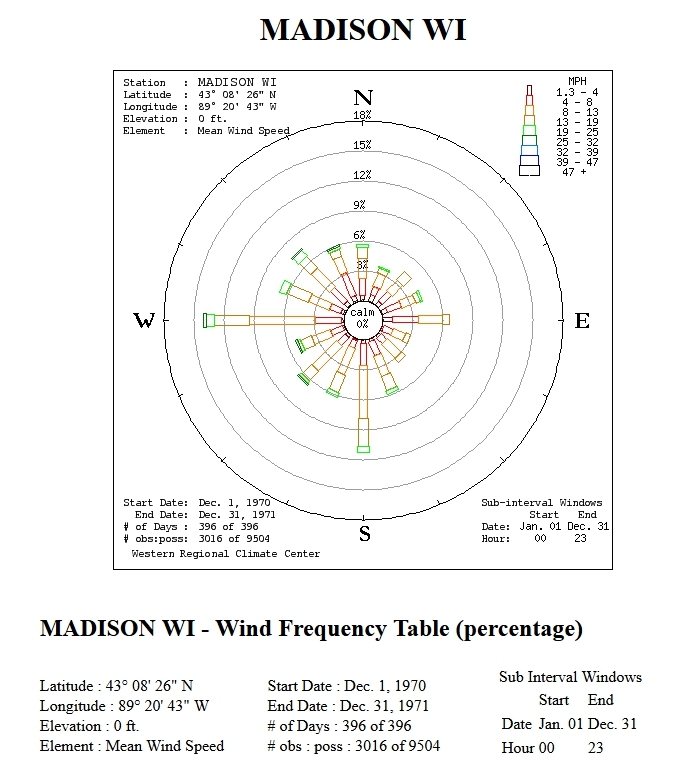 The circulation patterns in both Lake Mendota and Monona are well studied for a variety of reasons, including debris and algae distributions. I have no idea how fast you were able to paddle that raft, or if it was a streamlined raft built for speed, so I’m making an educated guess that your best paddling speed in still water would be around 1 m/s (2.2 mph). I also have no idea how fast the gyre current was that day, but it was obviously faster than you could paddle, so I set that at 2 m/s. Using these numbers it’s easy to see why, even though you were paddling toward the dock, you kept drifting backward. 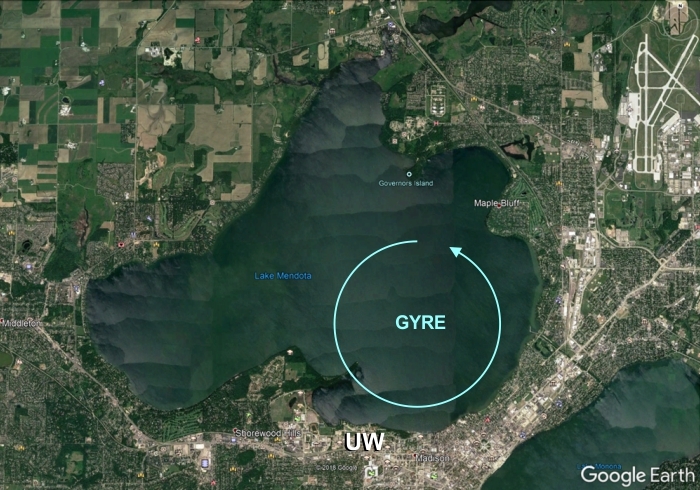 What was more surprising to me was that Lake Mendota has a gyre. Watching someone walking forward on an airport people-mover, and seeing their motion as that of skater or cross-country skier gliding forward. Sitting in a car at a stoplight, noticing the car next to you is inching forward, thinking your car is rolling backward, and hitting your brakes in a panic. Walking down an upward escalator just to see if you can outpace it, or walking up a downward escalator when the upward one you need has too long a line. Clearly, both Fessler and Hart understood what was happening. But it surprised me how many people reported relative motion effects they were unable to explain. Pilots, navigators, astronomers, and scientists in general are familiar with the phenomenon. All it takes for understanding is high school math. Alas, the concept of vectors (speed plus direction) seems to be one of those topics that are forgotten soon after the exam.